Photo: Munger Terrace Apartment Block, ca. 1891, 405 Mesaba Avenue, Duluth, MN. The townhouses were all different and had sixteen rooms, separate front and back stairs, central steam heat, running water on all floors, gas for cooking, and electric lighting. Listed on the National Register of Historic Places in 1976. Photographed by User:Elkman (own work), 2007, [cc-by-3.0 (creativecommons.org/licenses/by/3.0)], via Wikimedia Commons, accessed March, 2014. St. Louis County Court administrative offices are located at 100 North 5th Avenue West, Duluth, MN 55802; phone: 218-726-2460. St. Louis County  is located in Northeastern Minnesota and is the largest county east of the Mississippi River. It is an estimated 7,092 square miles in size, and has over one thousand lakes. St. Louis County is known for its spectacular natural beauty, including a national forest (Superior National Forest), a national park (Voyagers National Park), the Boundary Waters Canoe Area Wilderness, four state parks, and many popular recreational trails, including portions of the Superior Hiking Trail. St. Louis County has 26 cities and 73 organized townships. It also has 72 un-incorporated communities, 26 unorganized territories and 1 "Census Designated Place." There are about 32 persons per square mile. 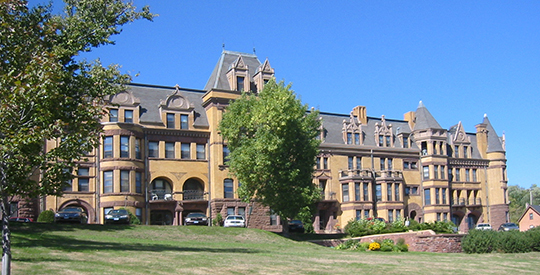 The city of Duluth serves as the county seat with a population of approximately 86,000. The Iron Range cities, Hibbing and Virginia, and the Lake Superior port city, Duluth, are the county's population and economic centers. Both population centers have international importance; Duluth for its freshwater port, which is one of the largest in the world, and the Iron Range for its large mining industry. Surrounding counties are: Carlton County to the south; Aitkin, Itasca and Koochiching Counties to the west; Lake County to the east; and Douglas County, Wisconsin, to the southeast (across the St. Louis River). The coast of Lake Superior creates part of the county's southern border, while the Rainy River District of Ontario, Canada, flanks its northern border. Taconite mining makes up a large sector of the region's economy, along with health care, timber, transportation, technology and tourism. Most of the United States' Iron Ore reserves are located on St. Louis County's Mesabi Iron Range, which has enough ore reserves to keep iron mining in production for more than 200 years. St. Louis County, MN, Comprehensive Water Management Plan: Update 2010-2020, www.stlouiscountymn.gov, accessed March, 2014.